In 2011, the jetBook Color eTextbookReader broke through the educational market to offer students and teachers the ability to save money on books while providing unlimited teaching resources. 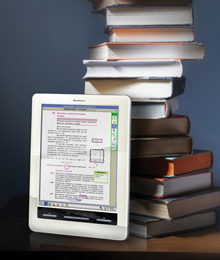 It is currently the only Triton Color EInk eBook Reader, and the first to successfully penetrate the educational market offering solutions for students' 21st century needs. Even before the award, the device was being vastly implemented into the educational environment in different countries, including Korea, Brazil, Russia and others. The Innovations 2012 Design and Engineering Award from the Consumer Electronics Association (CES) serves as public acknowledgement of the company’s achievement with this revolutionary device.